First we want you to know right up front that no reel-to-reel tapes have ever been lost in transit to us or from us. Also, after we digitize your reel-to-reels for the first time we keep a digital copy of your reels on hard drives here for 90 days. This means if something was to happen on the return trip or you needed additional copies, we could simply pull up our back-up files and remake your CDs. Also, when you fill out your order form we receive an electronic copy right away in our email. So we know who is sending what. If something doesn't arrive in a timely manner we investigate. We understand sending your irreplaceable reel-to-reel tapes to us for transfer can be a scary task. With a few steps of caution your reel-to-reel tapes can arrive just as safely as driving them across town. In over 16 years of doing mail order business we have never had a clients reel-to-reel tapes lost or damaged in the mail. The purpose of this information is to share with you what we have learned over the years. These are not just our opinions. They are prone to rip open during delivery. It seems like the logical choice for just one reel-to-reel or small reel-to-reels but please refrain. The post office will give you free boxes when shipping Priority mail, use them. Do not use "Media Mail". "Media Mail" is third class mail the post office uses for shipping books, tapes and other forms of media. Your reel-to-reel tapes would qualify for this type of transportation but we do not recommend you use it. Considering what you are mailing, this is no time to pinch a penny. Do not forget your Return address. Please make sure you have supplied a legible return address on the outside of the box. Also include your contact information inside the box. It is important to have an address on the inside and the outside of the box. If something was to happen to the box that left the outside label unreadable, the shipper will open the box and look for a shipping address inside. 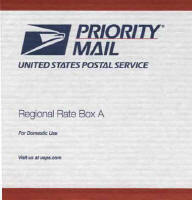 We highly recommend the Priority Mail service offered by your local post office. They will even supply you with a free box. This is a great way to ship your tapes. In most cases your tapes will arrive to us in 2 days. The less time your tapes have to travel the better.